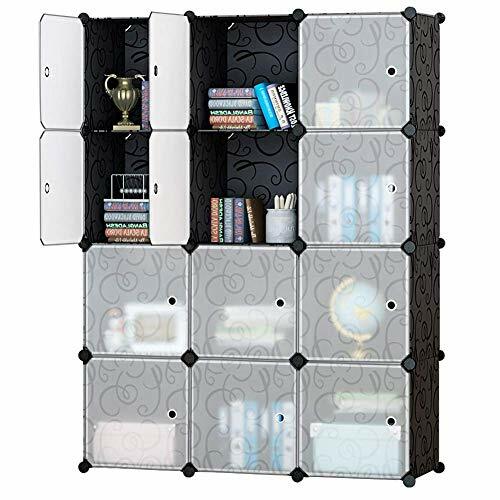 1.The plastic modular shelving organizer is an economic but elegant solution for storage and organization, whether at home, office or college dorm. 2. It features in ample storage, excellent stability and easy maintenance and provides extra fun of DIY. 3. 12 cubes allows you to separately store your items, save your room space and keep your room clean and tidy. 4. High quality eco-friendly material is healthy for family use. The closet is lightweight and compact when disassembled, convenient for moving. 5. This is not a expensive but functional piece for you to choose! 1.We focus on developing high quality products with low profits. 2.We will do our best to make every customer satisfied,we guarantee 1 year after sale service. 3.Honey Home Portable Closets will come with more accessories then other sellers,you can install it to be 12 cubes closet without hanging rail,or make it to 6 storage cubes+2 hanging cubes Wardrobe. *Please make sure all poles reach the bottoms of plastic connector holes and stick each cube all the way inward to make it firm when installing. *If you have left over parts after assembly please store them away. *For the safety of small children keep the small extra pieces out of reach. ★ CREATIVE DESIGN: Cubes can be stacked or used separately, and fit into different places with different styles of decoration. ★ MULTIFUNCTION: All kinds of clothes, books, toys, fabric drawers and other miscellaneous household items. Item comes with 12 cubes and extra 2 hanging rails which meets your different needs. ★ EASY TO MAINTAIN: Waterproof and easy to clean. Dust-resistant wardrobe. Door holes feature is designed for air circulation to prevent buildup odor. View More In Closet Systems. If you have any questions about this product by Honey Home, contact us by completing and submitting the form below. If you are looking for a specif part number, please include it with your message.